J Edgar Hoover is perhaps one of the most significant figures in twentieth century US history. He near invented the FBI; ran it and its predecessor for 50 years; held presidents and public figures in fear of his blackmail material; used the resources of the FBI to pursue personal vendettas and prejudices - against "reds" and civil rights activists - and forever damaged the balance between personal liberty and security. Hoover was involved in the crackdown on prohibition era gangsters; the Linbergh baby kidnapping; the McCarthy witch-hunts, "Cointelpro" and all the Cold War and anti-civil rights movement paranoia that followed. It is no exaggeration to say that he shaped US history. He did all this, but remained himself an enigma - unmarried, but with a suspiciously close relationship with his professional sidekick Clyde Tolson. Hoover was a man capable of viciously hounding public figures but also capable of inspiring such personal loyalty that his long-time secretary Helen Gandy destroyed all his personal files after his death before Nixon could get his hands on them. The odd thing about Clint Eastwood's new biopic is that it seems utterly unconcerned with Hoover's political and institutional significance. Presidents come and go, the Lindbergh case is used to enhance the bureau's power, but all this is merely grist for Hoover's emotional mill. McCarthy isn't mentioned - neither is Cointelpro. There is a brief scene where Hoover is trying to pressure Dr King, but nothing is fully explored. One leaves the film knowing no more about his real significance than when one enters the cinema. That emptiness and confusion is exacerbated by the film's structure - which cuts between a linear re-telling of Hoover's career highlights as he narrates a self-serving autobiography from the 1970s. Rather than create a biopic, Eastwood and screenwriter Dustin Lance Black (MILK) have decided to create a movie about a repressed love that just happens to involve famous historical figures. To that end, this is less JFK or W. than BRIEF ENCOUNTER. In Black's thesis, Hoover suffered his whole life from severe emotional repression. He fell in love with Clyde Tolson at first sight, but couldn't return his love physically because his domineering mother had so inculcated her shame at having a gay son. Even after her death, the relationship remained chaste - a love that was hidden in private as well as in public. This is, to be sure, a deeply tragic story, and I was genuinely moved by it. The scenes between Tolson and Hoover - a pivotal and rare emotional outburst at a hotel - the final scene together - are incredibly touching. But, unfortunately, that wasn't the movie I had been sold, and wading through the hours of running time - of famous politicians lifted up and cast aside - to get to these few emotional scenes - was just utterly dreary. The movie is a similarly mixed bag when it comes to the technical specs. Lensing by long-time Eastwood collaborator Tom Stern is straightforward, but the film is desaturated to within an inch of its life, leading to a distancing effect that is as artificial as Armie Hammer's make-up as the ageing Tolson (diCaprio has a far more convincing make-up job as the ageing Hoover). The period costumes and set are sumptuous - as one would expect from a big budget affair, but it all feels as deadened and manicured as Hoover's inner life. In terms of performances - diCaprio is typically impressive, but the real breakthrough is Armie Hammer - the emotional heart of the film, who even manages to move us through his terrible make-up - and Judi Dench as Hoover's grandiose, truly horrifying mother. I would love to see both get Best Performing nods, but I suspect that it's diCaprio who will take the glory come the Oscars. 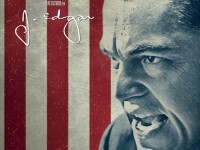 J. EDGAR played the AFI Fest 2011. It is on release in the US and Canada. It opens on January 6th in Greece, the Netherlands, Singapore, Italy and Norway; on January 11th in Belgium and France; on January 20th in Denmark, Sweden and the UK; on January 26th in Australia, Portugal, Brazil, Spain and Japan; on February 16th in Germany; on March 1st in the Czech Republic and on March 2nd in Turkey.